The shaft alignment process (or procedure) which is often also called “coupling alignment”, is a method (frequently adopted by maintenance departments) to ensure two or more rotating shafts are co-linear. I.e. the shaft centrelines are on the same straight line, both vertically and horizontally. It's a known fact that all rotating machinery is susceptible to (and frequently suffers from) misalignment. So this is important because couplings that are misaligned cost industry millions of pounds in (mostly unnecessary) maintenance and downtime every year. 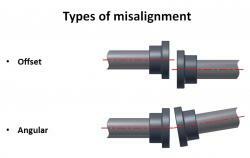 How can coupling alignment (especially Laser shaft alignment) save costs? Studies have shown that incorrect alignment is the cause for up to 50% of machine breakdowns. So it follows that correctly (and regularly) aligned equipment significantly reduces operating and maintenance costs. Vibration (in shafts and foundation bolts). Heat build-up (in shafts and couplings). Metal fatigue (in shafts, couplings & foundation bolts). Increased power consumption (as much as 20% on misaligned units). Unplanned machine down time (which can be very costly indeed). New equipment (long before you would normally need to). Quite simply what you need to do is to make sure your shafts and couplings are in close alignment (i.e. co-linear). This can be achieved by using a few different methods. The simplest method is to use a straight edge and your eyesight. This is quick and easy but is not very accurate at all and for most situations it is not good enough. The next choice for many years and the best way to align couplings until recently was using dial gauges (the Rim & Face or the Reverse Dial method). This is a fairly accurate method if used by a competent trained engineer but it is time consuming and has some drawbacks when compared to the latest method involving Lasers. Why are shaft alignment Lasers better? Unlike using the straightedge and feeler method or using dial indicators, Laser shaft alignment systems have graphical user interfaces and software packages that do all the complicated alignment calculations for you. Their beams are dead straight and aren't affected by gravity or any form of sag. Accuracy is built in as the detectors resolution is far greater than the human eye or any mechanical measurement method. In addition human error is almost totally removed from the process. Their use eliminates other effects such as coupling eccentricity, or runout. As the Laser targets are rotated to various positions around the rotational centres of the shafts only the rotational centre lines are measured. They can be used "Hands Free" as automatic measurements can be taken as the system detects the transmitter position and then takes measurements just as they are rotated into the right position. The angle that needs to be swept to get a reading can be varied and can start from any position. This allows readings to be taken when restrictions exist (such as pipes) that prevent large rotations. Their transmitters and receiver are often fitted with Bluetooth wireless communication systems allowing very easy remote measurements. No trailing wires getting in the way. This allows alignment of difficult to reach equipment from a safe position. Laser shaft alignment systems nowadays have amazing software applications to calculate extremely accurate values for shimming and horizontal corrections. Taking readings is greatly simplified with the use of images of the shaft and coupling showing what values to input and where. Some new systems like the unique Fixturlaser NXA Pro use gyros to present the user with an exact representation of the coupling as they move around the equipment. Thus greatly reducing the chance of errors and reducing the time required. Most systems including the Fixturlaser laser shaft alignment products use “live” measuring modes to monitor the actual shaft rotational centres during the movement process. This instantly shows both intended and unintended movements, allowing the user to monitor total movement values, and therefore know when alignment is complete. Most also allow you generate automatic reports and to store the before and after alignment values digitally (on a USB stick), for later use in maintenance programming and record keeping. Fixturlaser systems also have programs to measure and correct soft foot, bolt bound or base bound conditions. Plus the ability to accurately measure more complex alignment problems such as cardan shaft, or universal joint parallel alignment. Usually you can measure more than two coupled machines (trains) using the same equipment with a very similar measurement process. Lasers can measure vertically and horizontally orientated equipment easily and quickly. Some modern Laser systems have optional software applications and equipment to allow basic geometry measurements, such as flatness, straightness, and parallelism. Finally they can measure and compensate for dynamic changes in position, such as those caused by thermal growth of shafts and couplings. I.e. where a machine gets very warm during its normal working cycle or it is close to something that get hot. The modern equipment user interfaces with intuitive touch screen navigation provide easy to understand results that don't need the user to have extensive alignment knowledge. Also having a WYSYWIG (what you see is what you get) result screen that shows you both coupling results and required feet corrections (both vertical and horizontal) in real time makes it easy to make corrections you can trust. All of this means that with the most modern alignment systems you'll get the answers you need quickly and efficiently and therefore help you to align your coupling and get your plant back up and running really quickly. More can be read on the benefits of laser shaft alignment systems here.